Violet and Vermillion . . . The late summer harvest comes in swaths of white and gold tones. The drive to anywhere sees fields full of Goldenrods and Queen Anne’s Lace. The view comes punctuated by one detail important to tell. Out there, on the road, and even down here, within the city, New York City, there does exist a general wilt of plants along the open expanses where a vehicle or pedestrian passes. Dry days have been set in a long row. Near the rivers, the adjacent greens retain a flusher state, a fuller color especially where trees, mature, uncut trees, offer shade. Spots where trees stretch out a patchy canopy buffer a cooler, damper shade below. Along edges of light and shadow one may find the most wildflowers underbrush. Yellow Thistles do bloom through arid, weathered, rose bushes. Galinsoga fills fallow flower boxes projecting from the base of town house windows uptown and downtown. Along the park’s green, other, varied, color combos call. “This is New York!” one neighbor bellows with all politeness. More mellow is the Mugwort stating the same line in the manner a flower communicates its quiet beauty. When in bloom the wild plant you are looking at speaks for this same city just as well. The plant “I” does live here, just as much a neighbor. More of what “This is New York!” is, is the city where wind off water shushes through branches, places where the Wildflowers of the West Village reside. A blade’s edge of Manhattan faces New Jersey, offers in scattered portions a green face north at The Cloisters and Tryon Park down to Riverside Park down to Hudson River Park all the way to the very tip of The Battery. Where one sees this green from afar, one can up close find wildflowers in the extended, greater, West Village of Manhattan. Hedge edges bear sights, life, to witness. Plants bloom in organo-color with a variety often appearing in compliment to Charles Blanc’s meticulous starred wheel. Great Lobelia, Lobelia siphilitica, an American native, shares open space in some number with the annual Jewelweed, Impatiens capensis. Color complements: violet Lobelia set on pedicel attached to a rising stalk raceme; vermillion Impantiens gems hung from thin stems in a more rounded bush of thin leaves akin to Nasturtium. Both, too, do bloom with lobes of three. 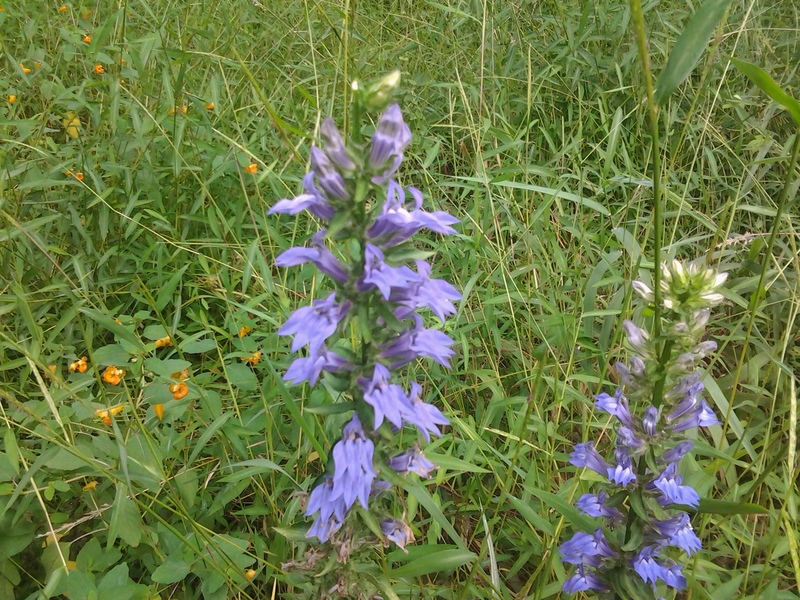 Great Lobelia’s look like a sharp tongue, Jewelweed’s resemble an ear. Number, form, color set and matched, as the US Open, all played out on a background of aged deep green, summer’s end time.